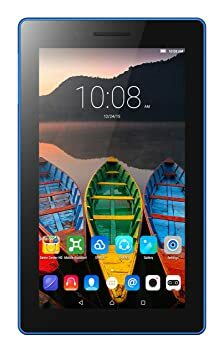 The price for Lenovo Tab3 7 Essential 8 GB 7 inch with Wi-Fi Only ( Black ) is valid across Bangalore, Hyderabad, Chennai, Mumbai, Delhi, Pune and Kolkata. The Lenovo Tab3 7 Essential 8 GB 7 inch with Wi-Fi Only ( Black ) is available at best price of INR 5000 on Flipkart. Shared my initial review below. Pros: 1. With the provided RAM and processor, it is fast. The applications, games, songs and videos are loading smooth 2. Pure android, so new bloat wares! This is really good for the given configuration. 3. As this tablet is meant for kid, it has an option as to when to start and when to shut down in the Settings. So you can habituate your kid to use only for stipulated time only 4. Screen is decent. You should not expect high resolution as it is only 1024 X 600. So the screen is good when viewed from half a feet distance 5. Battery stays for a long also charging takes a max of 3 hours to fully charge the 3450mAh battery. I have ASUS turbo charger for my phone. I tried that as well and the charging takes 2 hours to fully charge 6. No heating when playing games, watching video, playing music in full volume which is big plus! Cons: 1. Screen is not sharp. It’s smudgy because of the resolution and ppi. Its only 1024 X 600 with 179ppi 2. Expected the "Restart" button to restart the tablet, rather it shuts down. With repeated attempts, I confirmed this 3. Touch sensitivity is a bit lagging. Tried to close the Chrome browser tab and it was unresponsive 4. Swiping (from right to left) and closing the Google Now cards takes a bit of time. Not that fluidic 5. Reading photos from SD card takes more time. I mounted one of my 2GB cards and was trying to open a picture, it was slow a bit 6. Booting the tablet takes nearly a minute. 7. Marshmallow update is not there for this tablet as opposed to the spec given in the Spec sheet. 8. Accessories like cases / covers are very expensive in the web stores. There is no appropriate cases available yet. And the same goes with Tempered Glass. So it’s up to you to handle it carefully Conclusion 1. I initially though thru Micromax P680, iBall, Swipe, Lenovo Tab2 series and all and finally purchased this. 2. If you are gifting this to your kid, I would strongly recommend this as for 5000/- the tablet serves its purpose diligently. Can't expect more from this device. I am happy with the Prompt FlipKart delivery. Ordered on Friday and got it delivered yesterday!